In my blog post Did I have company? – posting 6 of 9 I showed photos of blue and red insects which, I now know, are not beetles but bugs. 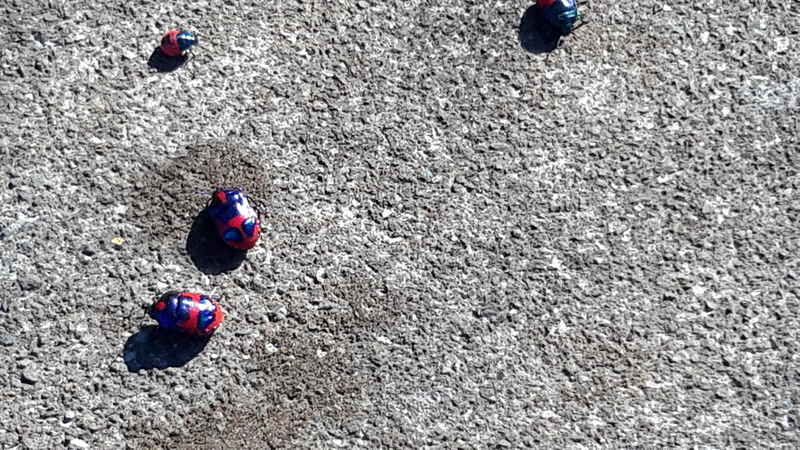 I have been reliably informed by Tony of Insects of Tasmania that what I saw and photographed are Shield-backed Jewel Bugs, from the Scutelleridae family. More information and photos of family members can be see here. I am still curious about the terminology. When is a beetle not a beetle? What is a bug? The Australian Museum in Sydney came to my rescue. I now know their mouth parts, wings, diet and lifestyle are quite different. However the information is insufficient for me to identify future bugs and beetles by sight. I would need to handle one and look very closely. But since I don’t like to invade the space of native animals etc, I will be most cautious now before jumping to conclusions. Another site informed me that ‘insects are divided into 25 orders and one order, Hemiptera, classifies bugs. The largest order, Coleoptera, classifies beetles’. So, on the basis there are more beetles than bugs, making a judgement that an insect is a beetle could be correct more than often than determining an insect is a bug. This entry was posted in Derwent River, Tasmania, Walking and tagged beetle, bug, Insects of Tasmania, Scutelleridae, Shield-backed Jewel Bug on March 3, 2017 by Tasmanian traveller.